I've wanted to bake an Easter lamb for a long time, but always found those lamb-shaped cake molds too expensive to use them only once a year. So when I found a cheap one right before Easter I jumped right in and made this cake. The recipe calls for two 8x19 cm molds (who actually has 2 of those? ), so I baked 2/3 of the batter in my 15x27cm mold, an the cake turned out beautifully. I was very easy and quick to prepare and just the right size for our Easter breakfast. Will make again next year. Against my better judgement I followed the recipe closely which tells you to bake the cake at 453F/230C for 35 to 40 minutes. Of course this was way too hot, and the cake was very dark already after 15 minutes in the oven. So I turned down the temperature to 375F/180C and the cake was done after 25 minutes. The outside was very dark, but the cake itself actually tasted really good and got rave reviews. 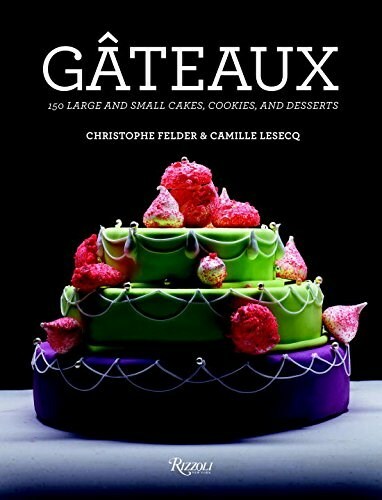 As a follow-up to his spectacular Patisserie, master pastry chef Christophe Felder presents Gâteaux, a beautifully illustrated guide to executing perfect cakes, from delightful small bites to showstopping centerpieces. Classic French pastry represents the pinnacle of control, elegance, and technique. From jewellike canelés and madeleines in a window case to burnished brioches at the boulangerie to showstopper centerpiece desserts at five-star restaurants, everyone loves a perfect bake. Precise instructions and step-by-step photographs guide bakers through 150 mouthwatering recipes, including one-bite delights, simple cakes, Sunday breads, celebration cakes, and tarts. Felder includes French classics such as sablés, éclairs, Saint-Honoré cake, tarte tatin, and croquembouche, regional recipes from Alsace, Brittany, and Provence, as well as his own twists on Belgian (Speculoos), German (Black Forest cake), and Australian (Pavlova) desserts. Each beautiful photograph will inspire bakers of all levels while step-by-step pictures clearly illustrate techniques such as making fondant flowers, constructing a charlotte, and braiding a brioche. To build younger bakers’ skills and confidence, Felder includes a section of easy recipes for the whole family—which don’t short on proper technique.